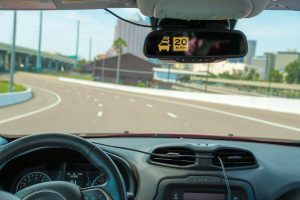 From a windy interstate highway out West to more crowded urban centers in the East, the United States Department of Transportation is putting connected vehicles through their paces with its Connected Vehicle Pilot Deployment Program. During the course of the pilot, the three sites — Interstate 80 in Wyoming, Tampa Hillsborough Expressway Authority in Florida and New York City — will be collecting data on how connected vehicle technology can benefit American roadways, including saving lives, improving personal mobility, enhancing economic productivity, reducing environmental impacts and transforming public agency operations. 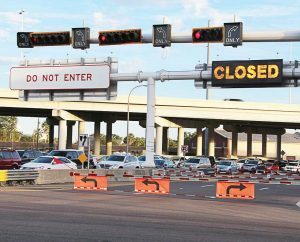 The Tampa CV Pilot launched in 2015 after the DOT awarded the Tampa Hillsborough Expressway Authority, or THEA, a $17 million contract. Since then, the pilot has become a partnership between several organizations. The implementation team includes HNTB, Siemens, the University of South Florida Center for Urban Transportation Research, Brandmotion and Global-5 Communications while other key partners are the Florida Department of Transportation, the city of Tampa, the Hillsborough Area Regional Transit Authority and Hillsborough Community College. The Tampa CV Pilot has gone through design and testing, working toward the third and final phase — deployment and data collection. Tampa CV Pilot will equip 1,600 privately owned vehicles, 10 buses and 10 streetcars with the onboard units. 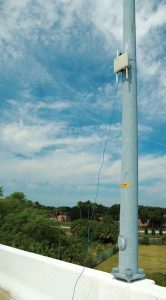 Outside of the vehicles, there will also be 46 roadside units, developed by Siemens, in the testing area — these will communicate not only with the connected vehicles but also with the city’s transportation management center, using dedicated short-range communications, or DSRC. Meanwhile for the vehicles, system integration partner, Brandmotion, has worked with Savari, Commsignia and SiriusXM to supply the units. These units display safety messages on an enhanced rearview mirror. 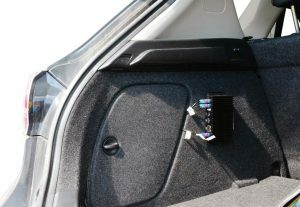 Vehicles are also outfitted with antennas and other equipment, like a short-range radio, designed to connect to other vehicles and infrastructure. 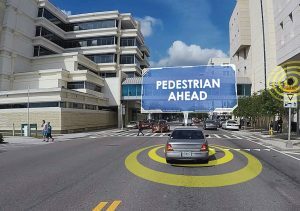 In the pilot program, the mirrors will warn connected drivers if another connected car has suddenly slowed or come to a stop in front of them; if they are approaching a curve at an unsafe speed; if they have become a wrong-way driver; if a pedestrian is in the crosswalk; and if it is unsafe to enter an intersection. For public transportation drivers, connectivity will also prove beneficial. Connected buses will be able to communicate with traffic signals on their routes, which will then prioritize bus movements when necessary, keeping them on schedule. For streetcars, connectivity will alert operators when a connected vehicle is about to cross the track, reducing the risk of a collision. Pedestrians will also benefit from the pilot at East Twiggs Street, where sensors will be placed to detect a pedestrian in the crosswalk. Roadside equipment will then broadcast that information to CVs in the vicinity. Much of the pilot requires drivers to step up and volunteer; otherwise, enough data could not be gathered. To entice volunteers to have the equipment installed in their private vehicles, THEA offered a savings of up to $550 on tolls. All volunteers needed to do was complete an eligibility questionnaire. 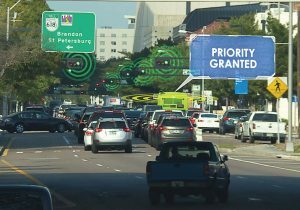 This also includes adding connectivity to public transportation systems, or even testing out autonomous features like Tampa and nearby St. Petersburg have. And with that sizable cache of data, Frey hopes the programs will spur the growth of connected vehicles, noting researchers involved in the program think in the long run connectivity in transportation will be a good thing. “Actually what we are doing is the entryway to smart cities,” Frey said. “Set up infrastructure for connective vehicles and then build off that to other areas. It’s a entry-level technology. “We’re all hoping this technology shows that we can solve (transportation problems) with a manage infrastructure approach rather than just adding another lane,” Frey added, noting the technology even shows the potential to accommodate future vehicle flow. “It’s another tool in the toolbox, something looking forward,” he said. Visit www.tampacvpilot.com to read more about the Tampa CV Pilot and www.its.dot.gov/pilots/ for an overview on the overall Connected Vehicle Pilot Deployment Program.